Travel with Kevin and Ruth! : The southern tip of Africa! The southern tip of Africa! The southern tip of Africa is at the community of Cape Agulhas. It's also the official dividing point between the warm waters of the Indian Ocean and the cool waters of the Atlantic Ocean. Yesterday, we drove from Hermanus to to the seaside community of Arniston, with a stop at Cape Agulhas. We didn't have any plan as to where we were spending the night. But we figured something would come together. And it did! 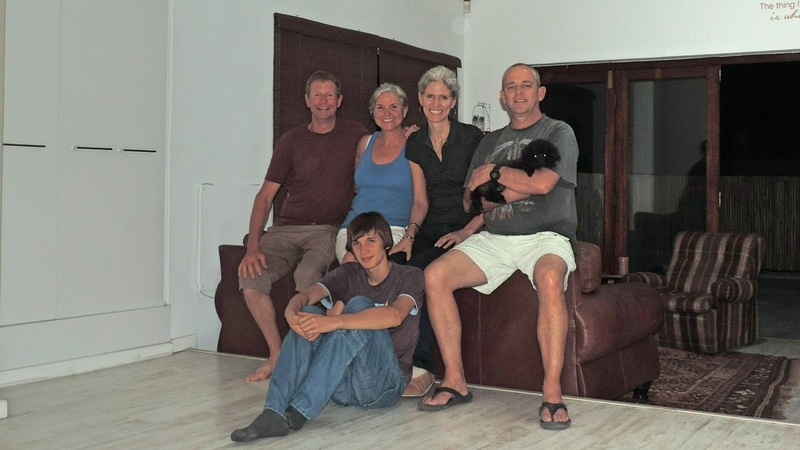 We said goodbye to our couchsurfing hosts Celeste and Greg. Thanks for hosting us! Kevin, Ruth, Celeste, Greg, Josephine (the dog!) and Milan (Celeste's cousin's son). Celeste had suggested that we make a worthwhile detour to the seaside village of Arniston. She said it's a pretty little place full of holiday cottages. We didn't have a plan, so figured we would stop in and see what it was like. Yesterday's drive 179 kms (111 miles). (A) Hermanus (B) Cape Agulhas, the most southern point in Africa, and (C) Arniston. We could have driven the easy route, but we thought we'd try for something more scenic again. Wrong guess this time. Turns out that we should have stuck to the paved road that goes through Napier and Bredasdorp. The route we took included some dusty dirt roads that simply weren't worth it. Oh well. We made it down to Cape Agulhas. It's a rocky shoreline that has claimed a lot of shipwrecks. We thought about staying at Cape Agulhas, and we probably could have got a place pretty cheap. High season ended when the kids here went back to school January 15th, so things are actually looking a little empty. Quite a few self catering and cottages with signs advertising for rent. We found the lighthouse, and a boardwalk that led us to the monument that marks the point. At the tip of Africa! The Cape Agulhas lighthouse. We could have paid R22 ($2.35) each to see their museum and climb to the top, but we weren't that interested. We decided to carry on to Arniston. If it was as pretty as Celeste had said it was, we wouldn't regret it. And even though we didn't know where we were staying, I was fairly confident that we would find a place now that high season was over and it was mid week. Arniston has a very pretty beach. And the sea is almost a Caribbean Sea color! We stopped at three different places and asked about accommodation. Yes, they had availability, but their smaller units were taken and they wanted R750 ($79.50) a night for the larger ones. We didn't need that, so we stopped at the next place. She wanted R580 ($61.50) a night, and the room was very nice, but it didn't come with enough of a kitchen and we wanted to make our own meals. The next one we stopped at wanted R600 ($63.50) a night, and it sounded perfect. So we took it! Not bad for $63.50 a night. Suits us just fine! And our balcony had a bit of an ocean view. We went for a late afternoon walk. Lots of white sand and ocean views. Ruth, with her feet in the Indian Ocean! She says it's a little warmer than when we went shark cage diving! However, speaking of sharks...I'm not sure we'll do any swimming here! Have to admit it was a pretty cool thing! "Warmer" is a relative term. I'm tempted to make a comment about the "washed up whale" picture that followed the one of Ruth. Hm.. better not. Of course, "Whale" can also have that Las Vegas meaning too y'know. Let's go with the inference. You are right warmer is a relative term but apparently up in Durban warmer is about 27C which is a beautiful temperature for the water to be and for Kevin to actually go swimming in. Probably a smart move not to comment, Bob! That and the temperature of the water would have stopped me. Well Dianne if you are going to Rome, then just book a passage to South Africa seeing that you will already by part of the way here anyway. Love being able to have cooking facilities in our room, it sure helps to save on meals out. Are there any black people in that part of South Africa?. I see none in your pictures. Interesting question. Yes, there are lot of black people (and colored people....and yes, there is a difference) in this part of South Africa. I'm going to do a blog post about this one day soon. Love the nice clear water, think I may have tempted fate and went for a swim anyway. Sharks or no sharks... looks awesome! It seemed to us that the people swimming weren't too worried about any sharks, I would expect for the most part there wasn't anything to worry about. Fabulous Header picture. You have been to the very bottom of the continent. Really cool!! Great looking spot you chose to stay in your host was right. We are really happy that we took Celeste's advice and stopped by to see if there was any accommodation available. It really is a very pretty place. Looks like a nice room and awesome beach there, but I would not be swimming either. I wouldn't have been swimming there either but only because the water still wasn't warm enough to go swimming, at least for us it wasn't. Would you bungee jump off this?? Who wants to go Paragliding?? How to Ride an Ostrich! Cage Diving with the Great White Sharks! Our first South Africa road trip! Penguins are so funny to watch! Best of the Gondwana Collection! We've joined the 21st century! Arrived in Cape Town, South Africa!